What’s the ratio between the highest and lowest paid full-time employee? What goes on the expense accounts? What kind of luxury trips are administrators taking on Williams’ dime? How does X compare to rival institutions? The growth in high-level administrative salaries is interesting to see laid out like this, but not especially surprising. 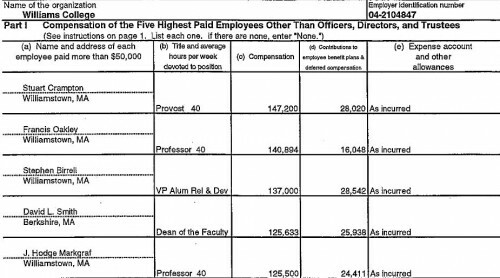 The salaries of University/College presidents have sky-rocketed in the past 20 years as they have become responsible for raising hundreds of millions (billions?) of dollars. The question is whether paying top dollar is required to get top-level results. Kudos to EphBlog for keeping these documents available over the years. Is there a way to deduce the college’s budget, or at least trends in the way the college finances its activities, based on both this and the college’s financial statements? http://controller.williams.edu/college-financial-statements/ It is hard to get a sense of the administration’s priorities, because it loves its secrecy. Would be very interesting to know why Williams is still not need blind for international students. 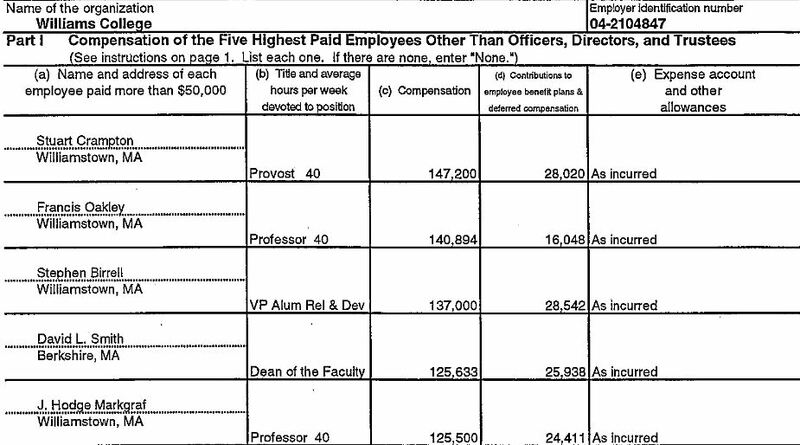 I know the college scrapped the policy because of the financial crisis and the resulting blows to the endowment, but wow, Williams is much richer than it was in 2008! It’d be interesting to look at these trends since 2000. JCD: interesting observation—and raising money for Williams should be easier than most places (so long as the priorities are kept in line with the expectations of alumni). That’s a good argument that X’s salary should be less than rival institutions’ (or fundraising goals should be higher). Seems to follow the same trends as executive compensation in the rest of the US economy. CEO pay goes up while worker pay stays mostly stagnant. Williams College is a typical left-wing organization. Equality for thee, but not for me. The required reading on campus should be George Orwell’s Animal Farm. EphBlog is powered by WordPress and delivered to you in 0.960 seconds using 36 queries..